The aim of this weekend is to socialise with like-minded geocachers, sharing all of our tips, tricks and stories. Over the course of the weekend, we will all be able to meet up with old friends and make lots of new friends too. This time of year can be pretty wet, but being geocachers, we won't be letting a little bit of water dampen our spirits. But just to be sure, the main hall and meeting rooms have been booked for some of the games and information sessions that are being scheduled over the weekend. This year's Event Geocoins have now arrived. And they look absolutely amazing - the team behind their production have outdone themselve, yet again. If you go to the website , you will be able to get your orders in early - don't leave it until the last minute because they will sell fast and you wouldn't want to miss out. You are obviously free to stay anywhere you choose and a variety of accommodation is available at the Village as well as in nearby Pinjarra and Mandurah. Fairbridge has a number of heritage-listed cottages, with about 350 beds available.The smaller cottages have already been booked, but there is lots of room left, if you are prepared to share a cottage with other geocachers over the duration of the event. 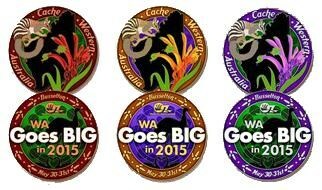 West Oz Geocaching is happy to act as a liason for bookings so that teams/families/individuals can share cottages/rooms. Please send West Oz Geocaching an email - telling us how many people are in your group, and how many bedrooms/beds you need and for which night/nights. We will then do our best to make sure you have somewhere to sleep. Camping facilities are also available, which you can book through West Oz Geocaching - just send us an email with your details. Check out our website for some more information about accommodation. We highly recommend that you do try and stay overnight and enjoy the social scene after hours. Some food will be available onsite too, so you should not have to venture too far from the festivities to feed your hungry hordes. Well, you need to plan to be there for starters. Start talking to family and friends - spread the word. 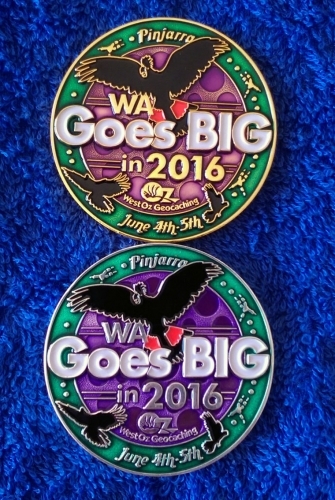 We had 125 teams attend WA Goes BIG in 2013, followed by 128 teams at WA Goes BIG in 2015 (BUT a lot more people!). So of course we are planning on it being as BIG, if not BIGGER. Click on the links below to view the 2013 and 2015 listings and check out the logs and photos. That should definitely inspire you to get your act together and start making plans. FYI: Having to work is not an acceptable reason for not coming. You just have to plan some leave time OR swap days off if you work weekends or shiftwork. So once you have minor detail organized, you then need to do a couple more things. Your “Will Attend” log should include and the total number of people from each team attending. THE MORE, THE MERRIER!! 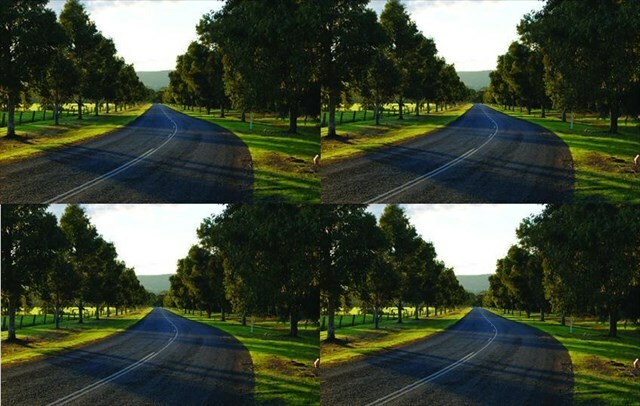 Truth be told, by hosting the event closer to Perth, we are hoping to at least double (triple??) the number of teams attending. Also, it would be most helpful to us if you could let us know how many Geo-Juniors will be coming as we are trying to plan lots of activities to keep them entertained, apart from all the activities that are already available to them at Fairbridge. When you log "Will Attend" you will automatically get any updates from us on the cache page. You don’t need to "watch" the listing unless you want to see who else is planning to come to the event. On Saturday night we will be providing a BBQ dinner at Fairbridge Village. You need to register for the BBQ dinner here. 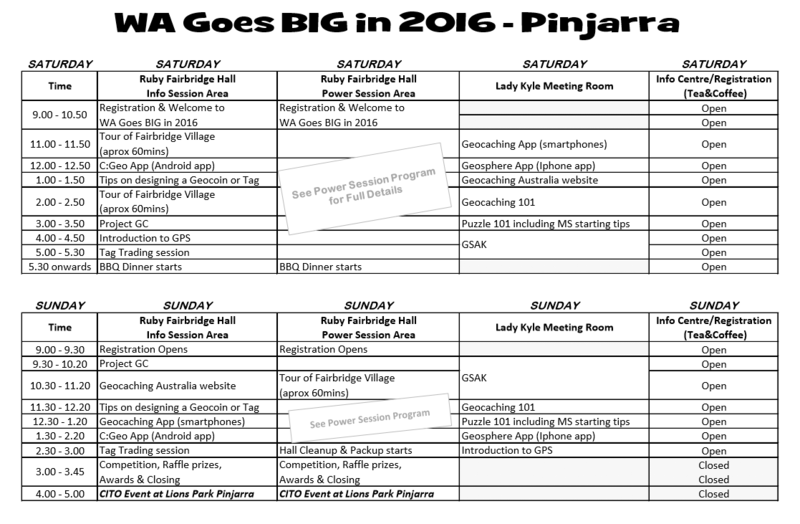 Between now and the event, the West Oz Geocaching committee will be working feverishly, trying to fit all our ideas into a timetable of the weekend's activities. Updates on the weekend's timetable will be posted on this page, so keep checking to find out what is planned and when. We are organizing a number of presentations, and "power classes", that will be beneficial to new cachers and old cachers alike. Come and have a listen as fellow cachers give you some insights and tips and you can ask some of those difficult questions. This event page will be kept up-to-date with the latest and greatest details but if you have any questions then let us know. For more helpful information about this event and other geocaching related information, just go to our website. If you'd like to be part of the team that plans WA Goes Big 2016, if you've got a great idea to share or if you'd like to volunteer your time or experience, we'd love to hear from you! 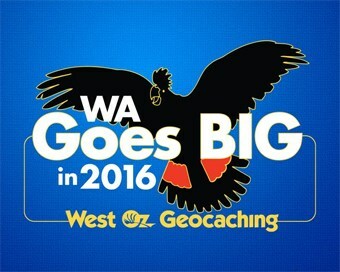 You can get in touch the the West Oz Geocaching Committee by sending us an email, or in person at any of our West Oz geocaching events.